Poetry is a wonderful thing: from the dust of letters it constructs an image -even if it’s only seen for a flash- that is unparalleled by normal prose. Maybe it is the way that rhythm functions, or how metre creates a skeleton for the meaning to skid from word to word. Or perhaps it is the freedom of blank verse- the way words are dashed onto the page, liberated from grammatical judgement. However, poetry is not so wonderful when it is displayed on Instagram. Judging by aesthetics, one might be fooled into thinking that the time spent on presentation was also mirrored in the writing process. How innocent you would be. Evidently, all one needs for a successful poem is your musing type-written onto artisanal paper, often with a jaunty flower on the side or expressive doodle. Now I would hardly say that the imagery or sentiment created by this little message by Hayley MacLeod here is particularly artfully done, or indeed moving at all. I would whip out the violin and throw roses in despair, not at the poem’s words, but in despair of how low the standards are becoming- but it seems like half the job is already done. The problem with Instagram-poetry is that it is not poetry at all. It is simply a mixture of emotions vomited onto a page, and not even a pretty background can hide that. Tears, applause and adulation will ensue, I promise you. This post by the (deep breath) famous Rupi Kaur received 351,000 likes. In light of this, it is absolutely devastating to think that laudable young poets, such as the winners of the Foyle Award, will be overlooked, struggling to sell copies of their work despite their enormous talent, when people walk around reading this absolute travesty instead. Kaur’s work is pitiful. No wonder she can churn out books so quickly, all she has to do is think of a neat sentence, press the space button a few times and voila. But what is more distasteful is how many people buy into her work. She has 3.6 million followers. And they all think of themselves as indulging in literature on their hourly Instagram scroll, when really the truth is far from it. They start on this lighter content and move onto more literary ground once they’ve found their feet. This is simply a naïve perspective. People view this poetry in passing, whilst on their feed, and then think no more about it. It is not like they are in the library, and are about to take out another tome by Sugercoat-my-Heart and then change their minds and pick Plath instead. I wish. No, the medium is the message. But, on the topic of books, something worse has happened. WOWEE. That really deserved a fat publishing deal did it not. I feel touched by an inordinate sense of distaste. Yes, having organs which regenerate and are resistant to disease is great. But this is not a fact which deserves to be indented in your book, Ms. F.D Soul. Another ARC was Nocturnal by Wilder and in short those poems were broadly the same except a bit longer and with references to the sea and the sky and sunsets and probably dolphins too, who knows at this point. At least the formatting was visually appealing. Full marks for effort. But from all this we can take away one thing. We are in an epidemic. Like the opposite of a poetry Golden Era. A Black Era, perhaps. Because now words mean nothing. They are tabbed and put intp nice font, but cumulatively they just carry no sentiment whatsoever, wistfully referring to “you”, their lost boyfriend, how they carried you in their heart but you were too heavy…. So, in short, Instagram Poetry really should be banned, for everyone’s sake. Second books, much like second albums, can be tricky to create. And if your first piece won a bouquet of prizes, including the Sunday Times Writer of the Year and the International Dylan Thomas Prize, then it’s difficult to imagine how one would even get started. Yet, Porter did start, and his new novel Lanny, is wondrous and mysterious. In many ways the novel seems like a fable, with the opening passage told by the spirit of the English countryside, Dead Papa Toothwort. Brooding and plotting, he seems far from those fairies we see frolicing around the pages of Enid Blyton; this character instead slithers throughout his land, listening in on the conversations of others and flitting in and out of the bodies of woodland creatures. The way these conversations manifest themselves on paper is a little jarring at first, or at least tacky in a sense. It seems somewhat reminiscent of primary-school books to have the font swirling around the page, although soon it melds into normality and it seems more appropriate for the context. After several instances of meeting these interjections however, it does become apparent that these overheard snippets, whilst well-written and fascinating, are however mainly irrelevant to the plot (the only somewhat useful snippet in the excerpt above would be “trust him with your kid”, as readers will know, and yet that hardly illuminates the plot anymore than if it hadn’t been read at all). So, in terms of being a plot device, although it is interesting and inventive, I tended to skip over it in the latter part of the book simply because it didn’t seem that useful. But back to Toothwort, he (or it,) has this bond with a small boy in a village, a boy whom everyone finds a little strange, a little queer, a little dazed, perhaps: Lanny. And so the novel, told through multiple perspectives, chronicles the life of Lanny as he starts to take outdoor art lessons with a famous artist from the village, and the way that relationship pans out. The multiple points of view interestingly became less distinct from each other as the book wore on: at the start of the novel Lanny’s mum had her perspective recounted in verse and then (for a reason I cannot find, but if you can please let me know) she starts to think in prose like the others characters. The same can be said for the others- they all seemed to blend into one after a while, aside from a few idiosyncratic remarks. But what makes Lanny such an impactful read is something else; it’s the portrayal of outsiders. Both Lanny and the artist, Pete, are essentially alone. They are misunderstood and shunned by others in the isolated village community, and it is the way as the book progresses that they are peeled apart and broken down in their individual ways which is so touching. This of course resonates with a contemporary audience because who doesn’t feel alone in a world where relationships are strengthened by talking through devices, whilst sitting in a room on your own? There is a sense of loneliness in all of us, and Porter truly does tap into that with his mythic, rustic tale. a character study: a curtain held aside, revealing the intricate little world of two people. No guns, no high stakes, just people living and the tragedy that ensues, as it may ensue with all of us, if only time will tell. people with deep character flaws, because the protagonists, Marianne and Connell, have many. An abundance, in fact. It is hard not to like them, though, because that is reality. No one is just a piece of a glass, we are all scratched in some way. something which spans the youth of the pair, following them from sixth form into adulthood, and chronicles how the relationship between the two develops. a book which will not affirm your life. Because it won’t. It will depress you but you will not stop reading because something in you wants to see where the shrapnel will fall. If you have answered yes to any of the above, then I prescribe to you: Normal People by Sally Rooney. No, Death. Something important: something looming in our faces, seen in every billboard and every smile. The flesh and the bones just waiting to turn to dust, the faces slowly decaying away until they are nothing but dirt. But there is a way past that: to see death and dying as a life process, a simple flicking of the switch of morality, instead of the emotional wreck that it really can be. All this can be achieved, or at least the journey begun, with a reading of Professor Sue Black’s book All That Remains. It has the remarkable ability of talking about death without being awfully morbid- it being through the lens of one of the world’s best anatomist and forensic anthropologist. She is writing from a wealth actual of experiences spanning from war crimes in Kosovo, trying to identify the bodies of the dead, her job lecturing at Edinburgh University to leading high profile court cases. So when she writes about her interactions with death, you know that she has a lot to offer, and in some cases things which rarely have been seen outside horror stories. Indeed, Black shines a light onto how something as simple as a bone can reveal a multitude: someone’s diet, age and weight, and she speaks candidly about her work with cadavers and how crucial they were to developing her own understanding of her profession as a student. In fact, after having read this book, it will seem almost impossible not to want to donate your own body to science, given how eloquently she puts forward the sheer usefulness it offers. Of course, this book does cover sensitive issues, death being a taboo subject in Western society and all, but seeing as Professor Black offers an ideal balance tonally between scientific and emotional, nothing jarrs. Yes, it is hard to describe a book which is so unique in its approach and subject, but in short, if you had ever had a question about death, or felt somewhat uncomfortable about it, then this should help put you at ease, fascinate, and even delight you. Angie Thomas’ debut novel, The Hate U Give, has fundamentally changed the YA literary genre. Following in the footsteps of many LGBT works, Thomas has proved that this type of fiction can also be an excellent way to provoke conversations concerning gun violence and race, even if parts of her novel are fundamentally flawed and undermine her main message. Thomas tells the story of Starr, a 16-year-old black girl who is caught between two realities: that of her privileged white school, and of her home life in a predominantly black, poorer neighbourhood. Thomas herself had a similar upbringing, in many respects, but shockingly could even relate to the aspect of the novel where Starr’s friend, Khalil, gets needlessly killed by a policeman after being pulled over. This is the crux of the novel: the aftermath of the tragic shooting on Starr’s life, amidst the underlying tension between her two lives, and of Starr’s progression from fear to finding a way to use her platform and try to take action on behalf of Khalil and everything that his death represented. The obvious merit of this novel is that it presented racial inequality in America in a way which is easily digested. News stories are often very blandly, despite their shocking content, because of the lack of a strong narrative element and due to the monotonous language used to describe momentous events. Thomas, however, of course allows for some characterisation, and offers a lens beyond the stereotypes that the media, failing to expand on headlines, has frequently perpetuated. Reading fiction about these kind of events allows the story to be understood in a way which is more relatable: the rich nature of the text, concerning Starr’s and Khalil’s personal lives, help to indicate that actually there is much more to them than simply victims of crime, something which contemporary protests against police shoots aim to achieve, but often not quite as effectively as Thomas seemingly has. Therefore from that perspective, Thomas’ work is revolutionary, seeing as many people still have -unconsciously or not- a racist mindset, and thus to read a book which forces them to empathise from another point of view is invaluable. This is a troubling quote, because what Thomas is doing here is creating a world which is basically black people versus white people. The focus of the policeman should not be his skin colour, and nor should his skin colour be equated to an emotion nor have negative connotations, as is implied in the excerpt above. Understandably there is institutional racism, but surely the focus of Thomas’ novel should be more on the failure of the justice system to condemn the police-officer, and not because the police-officer was white himself. More white people than black get killed by police officers every year, TIME notes, and therefore this commentary on racial bias is not as pertinent as it may initially seem. If the focus had been tilted slightly to the law, then the message behind this book would have been much more appropriate. Is this spreading the right message? No. What is worse, is that Chris seems to take these generalisations and run with them, and it seems ironic that Starr, a character who is supposed to develop into an icon of equality, is the one who perpetuates this rhetoric at the end of her developmental arc. It just seems inconsistent with what Thomas is trying to achieve, because racial equality applies to everyone. In general, though, The Hate U Give is a worthy read, as it does have an important intent behind it. However, if you are interested in racism, then just read Reni Eddo-Lodge’s book instead: it is factual, well-written, and absolutely fascinating. And here sits words, they together being both Milkman, and simultaneously number one prize winner in twenty-eighteen. It seems odd. Many have complained about their not-wanting-to-read-it feeling. ‘Challenging’ that it was: although the shiny pinkness it exuded might have made them feel safe, because that it was what they came to the pink book for, yes. That was my answer, and another answer is that perhaps the problem is not with the book, but with the readers’, the objectors’ literacy. Or their poor literacy. Not everything is limited to a monosyllabic nature, even if that is essential a twenty-first-century-mode-of-communication, headless of the need, or is it heedless, or is that the same thing now, that in real life people talk more and shout less than they do in that other place, the internet. Because, of course, there is still culture, somewhere in the world, although not in the maybe-hole-of-the-internet that everyone lives in now. The real question- the one we should be asking ourselves, and not only because asking questions is important, but because it allows us to feel like to have some autonomy in matters which really do not concern us, individuals- is will Author, the one who gave us the gift of difficulty and through Narrator reminded us that reading-while-walking is a dangerous activity, will Author be able to continue on her one long path down the halls of authors and poets who write Classics and become pictures of classical greatness. One good pink book is something, indeed, but another book in the same specific tone, about the sadness or the troubles or the difficulties in that warping nineteen seventies madness, and it could be jamais-vu. Today people might find tablets girl, a.k.a. girl who was really a woman, something to talk about, but if another maybe-boyfriend hoards superchargers in the same way but in another text, will the problems be limited to ‘over the water’ or will Author struggle to find her book land after the splash, quite a splash, that was made by this pink book? It is a good time to meet Milkman nonetheless. Well, no, it is never a good time to meet The Milkman, (not The Real Milkman, but) renouncer-in-state Milkman Milkman, because that is when Narrator becoming interesting. Becoming interesting is a problem. Eyes on you and beyond you, the rumours becoming truer than true and you sit here wondering well hell is this not our world, were those implicated for violences and celebrity rumours guilty of everything that they were told they deserved. Terrorism is a theme for today, being that people are terrorised today by everything because that is what they were taught, but not in the same way that people were taught not to be too sad if Somebody McSomebody’s brother’s head was in the road. And then there is being interesting, as aforementioned, but not in the way of flashing lights, also, either, but in the way that interesting manifests on trains and buses and lots of people pressed together and one single Milkman driving his white van alongside the road whilst you are reading-while-walking. Not having paragraphs is something strange, to be grappled with. Difficult it is, to be stopping, pulling away, because breaks are not clean and today we like a clean-break life, yes. Tell me, you like the clean-breaks but life is not like that, no, it is one long messy feed of pictures and noises and message you do not want to read but do because you are bored, and anyway: relevancy. Relevancy. We will read the pink book, winner of the big prize? Yes we will, reader-of-mine. Was Hardy really a feminist? In the past, I have not been the most enthusiastic reader of Thomas Hardy’s work. Having read Tess of the D’Urbervilles for “fun” in the Summer, I had decided never to look at his work again, until, of course, I was set Far From The Madding Crowd as a text. Karma, thank you. The impression I was left with was not…great: the heavy and somewhat pointless descriptions of landscape dominating the novel just did not enrapture me. But you know all this! The real question is- am I glad that I had to study this, in the end? 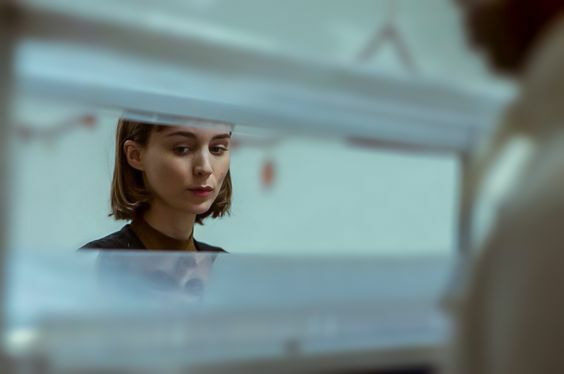 This film still, from Carol (2015) would be very hard to put into writing, due to the obscured nature of the model/ actress herself and the nature of the reflection. Thus for Hardy to be able to explore perspective in that way is admirable. This is concerning Far From the Madding Crowd, because of course in Tess of the D’Urbervilles he is does prove himself otherwise. But in this earlier context, it is uncertain if the plot actually supports Bathsheba taking on her own farm, and therefore the idea of “the women in the role of responsibility” that she represents. She is portrayed as, unusually for the context, a woman independent from the authority of men, by owning a farm. This ownership was given to her, not earned, through her uncle’s will, which means that Bathsheba’s use of this power is even more important. If she had bought the farm herself, and then failed, at least some merit would be given to her for being able to make the money to buy the farm in the first place. But here, she is simply being given an opportunity on a platter, and as it is clear to see, she squanders it. She almost lets all her sheep die from an illness, simply due to pride, and she spends the entire novel being swept away by various men than tending to her farm. It is as if Bathsheba is incompetent, because when every time she checked the farm at night, Gabriel “almost constantly preceded her in this tour every evening, watching her affairs”. Whilst this may be attributed to devotion, there is also a sense of her lack of skill. As if Gabriel is also following her just in case she misses something, because that is what was expected of women. What is more, when Bathsheba is at the marketplace, instead of focusing on her work, Hardy portrays her as being purely vain and concerned that there is a “black sheep among the flock” because one man was not looking at her. It is this scene where Bathsheba had a chance to assert herself in the an all-male environment, and yet instead Hardy chooses to portray her as wasting her time, despite all the power and opportunity she has been given. Even if that interpretation is wrong, the narrator is highly sexist, making claims like: “women are never tired of bewailing man’s fickleness in love, but they only seem to snub his constancy”, or how she was a “novelty among women- one who finished a thought before beginning the sentence which was to convey it”and also “the numerous evidences of her power to attract were only thrown into greater relief by a marked exception. Women seem to have eyes in ribbons for such matters as these”. It could be argued that the narrator does not reflect Hardy’s true feelings: that these harsh, sweeping generalisations are what Hardy expects the public want to hear. But this does not make sense. Nowhere else in the novel does the narrator explicitly express an opinion, or pass judgement in this way. Therefore the narrator is not a character, which means that the things they say are assumed to be true. Thus one cannot assume that Hardy included this bias consciously, and therefore that he was, at this point in his writing, still not the feminist that he is lauded as being today, in light of the casually sexist narrator and Bathsheba’s failure to handle the responsibility she has be given- which is normally only given to a man- thus suggesting that women as a group were incapable of labour. Overall, although it was interesting to pull apart the themes of the novel in seminars and to make presentations upon the characters, reading Far From the Madding Crowd was an unsatisfying experience. The story was initially drab, and the plot finishes off incredulously, and although Hardy had the perfect opportunity to create a heroine, instead he makes a fool. about the faults of our times. will come my way if I do? repetition, which makes surely her friendless. So others can be born. so others can be young. The point of life is live. Love if you can. Then pass it on. and stereotypes for its wings.